This "All-on-Four" solution is attractive to patients wanting to get rid of their dentures, and to people with failing teeth in need of a full upper and/or lower restoration. This procedure, as the name implies, only requires four dental implants per jaw to support a fully customized set of replacement teeth. The entire "All-on-Four" treatment is completed in less than 3 hours in most cases, and the best part is that the procedure is painless and the patient receives their full set of replacement teeth immediately. Remaining teeth were comfortably extracted, Painless Dental Implants placed. Approximately 2 hours later, Steve walked out of the office a New Man! 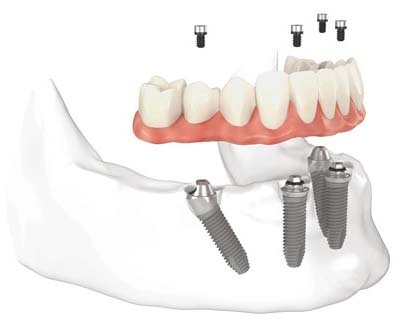 Modern implant-based dentistry has provided a solution to the edentulous 'toothless' patient that traditional dentures have never been able to deliver - immediate functionality with substantially increased quality of life. This is accomplished through a prosthesis held solidly in place by four dental implants (the "All-on-Four" Procedure) which not only provides the comfort and security a patient is likely to be missing with removable dentures, but as importantly also preserves bone in the jaw. In addition to receiving a fully customized set of replacement teeth in just one day, another tremendous benefit afforded by the "All-on-Four" procedure is its ability to almost always bypass the need for bone grafting - a surgery frequently required by more traditional treatment for patients with substantial loss of bone in the jaw. The "All-on-Four" procedure eliminates the day-to-day frustrations and discomforts of dentures, and patients can once again enjoy the dietary freedom of those with natural teeth. It is the most sophisticated solution there is to tooth loss and edentulism.